Preheat oven to 350 degrees. Grease & flour 2 round cake pans; set aside. Prepare cake batter as directed on package. Pour half of the batter into a medium bowl. Add dry gelatin mix; stir until well blended. Spoon half of the white batter & half the pink batter side by side, into prepared pan. Swirl batters together. Bake 30 minutes. Cool 30 minutes in pans. Remove to wire racks; cool completely. Mix sour cream & powdered sugar in medium bowl until well blended. Gently stir in whipped topping. Place one of the cake layers on serving plate; spread top with 1 cup of the whipped topping mixture; then sprinkle on 1 cup of sliced strawberreis. 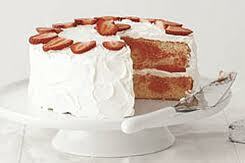 Place second layer on top and then frost top and sides with the whipped cream mixture. Garnish with remaining 1/2 cup strawberries just before serving. Store leftover cake in the refrigerator. *Note: This has been a family favorite for YEARS! Mostly just eat them straight out of the fridge…if they make it TO the fridge! They also make great garnishes for all of the desserts. We are using them in our new fruit infusion water pitcher too! Nice to hear from you Elaine!